Here are a few of the reasons why you should consider decorating your fence before spring returns. Fences of all shapes and sizes help us to feel safer. They’re also classic icons of having found a cozy place to call home. Decorating your fence can help boost your curb appeal, but it can also be a way to express your personality. If you live in a rental property, you might need to put up a fence for your dog. But that doesn’t mean you can’t go to great lengths to make it creative and fun. Here are a few of the reasons why you should consider decorating your fence before spring returns. Drawing lines around your yard with a fence can make your space feel squeezed. Don’t box yourself in with a bland, boring, fence. When you start decorating, feel free to jazz it up! 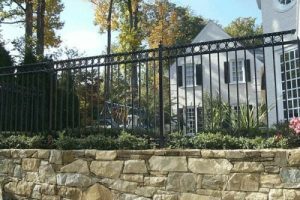 Using a decorative fence is one option all by itself. Even if you are using wooden privacy fences or wrought iron fences to block out anyone you don’t want seeing what you’re up to, you can still find ways to paint them and make them more attractive. If you’re thinking about a new way to liven up your yard this year, consider installing some corner fences. Corner fences can be used to mark the edges of your property. However, you can also leave your yard open and avoid that feeling of being closed in; fence panels are used to indicate a corner angle, but the rest of the fence isn’t there, allowing the viewer to use their imagination as to where the rest of the fence would be. Although fences are mainly used on the edges of where your yard begins and ends, that’s not all it can do. You can also use a decorative fence to brighten up the parts of your yard that you would like to differentiate from one another. Hide an electric generator that you have set up in your yard, or hide the tool shed or chicken coop from your curious pet. You can also use fencing materials to protect your garden from interlopers like deer or squirrels, or you can put a fence around your spa, hot tub, or swimming pool! This entry was posted on Friday, February 1st, 2019 at 1:49 pm. Both comments and pings are currently closed.